Scientists have been trying for years to make a practical lithium-ion battery anode out of silicon, which could store 10 times more energy per charge than today's commercial anodes and make high-performance batteries a lot smaller and lighter. But two major problems have stood in the way: Silicon particles swell, crack and shatter during battery charging, and they react with the battery electrolyte to form a coating that saps their performance. Now, a team from Stanford University and the Department of Energy's SLAC National Accelerator Laboratory has come up with a possible solution: Wrap each and every silicon anode particle in a custom-fit cage made of graphene, a pure form of carbon that is the thinnest and strongest material known and a great conductor of electricity. In a report published Jan. 25 in Nature Energy, they describe a simple, three-step method for building microscopic graphene cages of just the right size: roomy enough to let the silicon particle expand as the battery charges, yet tight enough to hold all the pieces together when the particle falls apart, so it can continue to function at high capacity. 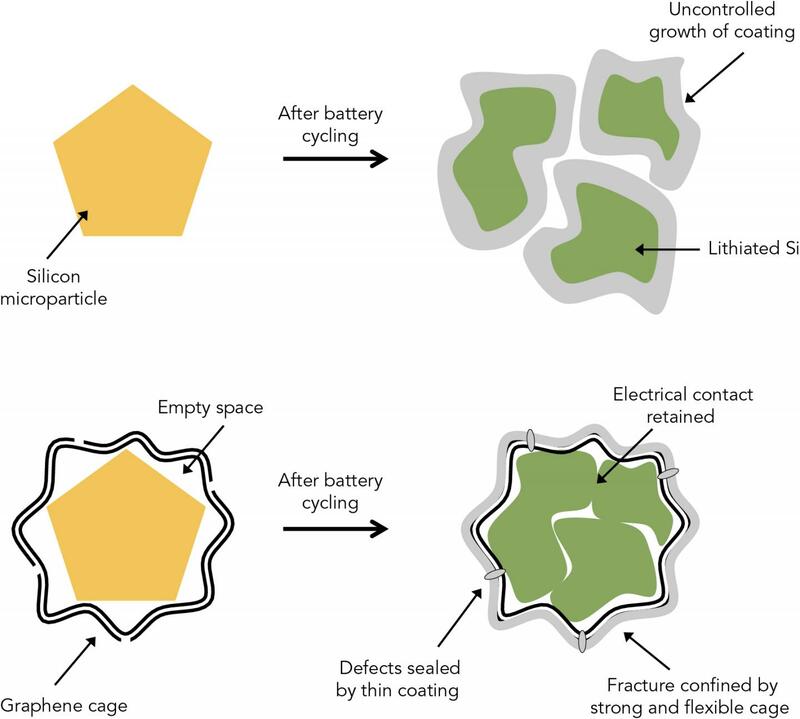 The strong, flexible cages also block destructive chemical reactions with the electrolyte. "In testing, the graphene cages actually enhanced the electrical conductivity of the particles and provided high charge capacity, chemical stability and efficiency," said Yi Cui, an associate professor at SLAC and Stanford who led the research. "The method can be applied to other electrode materials, too, making energy-dense, low-cost battery materials a realistic possibility." Lithium-ion batteries work by moving lithium ions back and forth through an electrolyte solution between two electrodes, the cathode and the anode. Charging the battery forces the ions into the anode; using the battery to do work moves the ions back to the cathode. When it comes to making silicon anodes, scientists have been stymied by the fact that the silicon swells to three times its normal size during charging. For Cui and his collaborators, the quest first led to anodes made of silicon nanowires or nanoparticles, which are so small that they are much less likely to break apart. The team came up with a variety of ways to confine and protect silicon nanoparticles, from structures that resemble pomegranates to coatings made of self-healing polymers or conductive polymer hydrogels like those used in soft contact lenses. But these were only partly successful; the efficiency of the resulting anodes was still not high enough, and nanoparticles are expensive and hard to manufacture. "This new method allows us to use much larger silicon particles that are one to three microns, or millionths of a meter, in diameter, which are cheap and widely available," Cui said. "In fact, the particles we used are very similar to the waste created by milling silicon ingots to make semiconductor chips; they're like bits of sawdust of all shapes and sizes. Particles this big have never performed well in battery anodes before, so this is a very exciting new achievement, and we think it offers a practical solution." For the graphene cages to work, they have to fit the silicon particles exactly. The scientists accomplished this in a series of steps: First they coated silicon particles with nickel, which can be applied in just the right thickness. Then they grew layers of graphene on top of the nickel; happily the nickel acts as a catalyst to promote graphene growth. Finally they etched the nickel away, leaving just enough space within the graphene cage for the silicon particle to expand. "Researchers have tried a number of other coatings for silicon anodes, but they all reduced the anode's efficiency," said Stanford postdoctoral researcher Kai Yan, who carried out the experiments with graduate student Yuzhang Li. "The form-fitting graphene cages are the first coating that maintains high efficiency, and the reactions can be carried out at relatively low temperatures." Now the team will work on fine-tuning the process, Li added, and on producing caged silicon particles in large enough quantities to build commercial-scale batteries for testing.